With the famous (infamous?) Red Bull Miami Flugtag right around the corner, South East Florida SAAC has been hard at work getting its entry ready for the airshow. For those of you who don't know, the Red Bull Miami Flugtag is an airshow unlike any other. It's an open event for seasoned, amateur, and intrepid aeronautical engineers to devise flying machines. The point of the event is to get these homemade aircraft to coast up a ramp and go temporarily airborne before crashing spectacularly into the Atlantic Ocean. And now, it is with great pleasure that we announce South East Florida SAAC's entry into this year's Flugtag. They said it couldn't be done. Throughout history, the doubters have said: "Man will never cross oceans," or "Man will never land on the moon," and even "Put that down you'll put an eye out with that thing - what are you, crazy?" History has proven them wrong, except for some guys with eye patches. 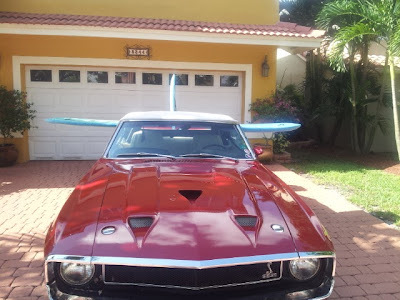 This year, at the Miami Flugtag, SEFLSAAC's entry is this fine 1969 GT500 soaring- and surface-vehicle. Its design is beautiful and practical. SEFLSAAC turned to professionals for help - the son of one of our team members who works at NASA. Although we can't reveal any names, we can divulge that our NASA contact provided us with an space-age composite substance that is sturdy, lightweight, and floats on water (Styrofoam). We got our hands on enough of this exotic material to fashion wings and a rudder for our Flugtag craft. Given the elevation of the launch ramp, and the vehicle's wingspan and horsepower, we estimate that our Flugtag flying machine will catapult across Biscayne Bay in downtown Miami and land somewhere on a Caribbean island. See you at Flugtag! Auf wiedersehen!